Paradyne Coatings & Machine Company, Innovated Treatment Coatings (Electro Ni/Co - Co/Ta - Micron Treatment) technology provides extreme durability and increases endurance that is tougher and has significantly higher abrasive wear resistance than those provided by conventional standard surface coating processes outlasting PVD coatings such as titanium nitride (TiN), titanium carbonitride (TiCN), and chromium nitride (CrN). It impregnates into molecules of the steel porosity microstructure providing the steel’s working surface with more extreme durability to withstand the hard materials involved in the manufacturing stage of the metal stamping industries such as heavy duty deep drawing, forming, blanking, punching, extruding, progressive die sections for stainless, hot rolled & cold rolled steel, aluminum, 4140, galvanized steel, carbon steels running materials in deep drawing and forming applications. Penetration depth will be different depending on composition tooling is made of, between forty – eighty-thousandths depth penetration. Our process improves quality working surfaces of dies to resist galling, chipping and wearing and maintain a long-running die in production without change out for a much longer period of time, compared to uncoated or conventional coated tooling. Paradyne Coatings & Machine process that we are utilizing is not even compared to nitrating or thermal diffusion coatings that seize and distort die steels, Paradyne Coatings & Machine’s method is to pregnant a die steel with our proprietary wear-resistance alloy that embeds into the steel porosity below the microhardness creating a protective barrier that separates the chrome atoms to prevent galling, and pick upon die surfaces. These process increases die life from a minimum of (3) – (8) times longer than your present use application virgin or coated tooling. 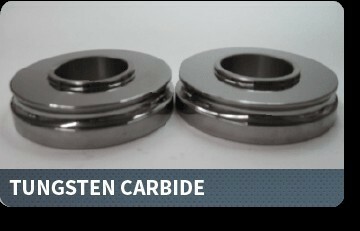 Paradyne’s treatment’s high hardness and low coefficient of friction on the tool surface help the tool to run longer. The high hardness restricts abrasive wear, and allow coefficient of friction provides additional lubricity to the die steel surface. Our process will not change any critical tolerances or radius’s to the die surface and also provide a smoother micro mirror finish of a double zero micro that will not flank/chip off like chrome or polishing intends, our mirror finish is created from the Nano size particles being embedded and bonds to the surface of the die/surface resulting in less polishing and reducing friction as well. Our process is controlled temperature and is placed in a vat deposition chamber to control temperatures involved in the process to prevent brittleness and distortion. Stainless, hot/cold rolled steel, aluminum, carbon steel, 4140 alloy steel can be deep draw, formed, blanked and achieve 3-8 times more life with running those materials in the manufacturing process, all work will be warranty from 3-12 months per die against wearing, galling, chipping, and flanking. Un-coated tools can wear out quickly. Ordinary coatings can help, but the combination of high pressure, heat, and abrasive material can overcome the adhesive strength of the coating and peel it off in a matter of short time. Surface enhancements critical to extending the life of punches or dies. Electro Micro Treatment coatings by Paradyne will help manufacturers keep critical tooling run longer in production.